A number of people ask me from time to time for photos, videos and publications from my research that are difficult to find simply by Googling. So I decided to create a digital place that archives my research. It is still very much work in progress but is gradually getting populated with more content. The site has evolved from my former website at the Open University and before that Indiana University. The artwork in the banners is from a painting I did when I was about 13 years old. I was influenced at the time by the artist Yves Tanguy. The photo of me was taken in 2003 in the window of my office when I first arrived at IU in Bloomington, Indiana. Yvonne Rogers is the director of the Interaction Centre at University College London, a professor of Interaction Design and the deputy head of department in the Computer Science Department. Former positions include professorships at the Open University, Indiana University and Sussex University; she has also been a visiting professor at University Cape Town, University of Melbourne, Queensland University of Technology, Stanford University, Apple and UCSD. 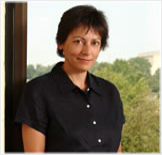 She is internationally renowned for her work in human-computer interaction, interaction design and ubiquitous computing. She was awarded a prestigious EPSRC dream fellowship to rethink the relationship between ageing, computing and creativity. She is passionate about designing computers that are engaging, exciting and even provocative. She has published over 250 articles, and is a co-author of the definitive textbook on Interaction Design that has sold over 200,000 copies worldwide and been translated into 6 languages. I started writing interactiveingredients back in 2011, when I began working at UCL and embarked on my dream fellowship. It comprises musings and reflections on a range of topics including food, aging, design, cooking, creativity and technology.